Premium Quality W84030H Photoconductor Kit compatible with the Lexmark W850. The use of compatible supplies does not void your printer warranty. Premium Quality 12A1970C Black Inkjet Cartridge compatible with the Lexmark 3200/ ColorJet 3200/ 5000/ 5700/ 5770/ 7000/ 7200/ Optra Color 40/ 45/ X125/ X63/ X73/ X83 All-In-One/ Xb4/ X85/ Z11/ Z31/ Z42/ Z43/ Z45/ Z45se/ Z51/ Z52/ Z53. The use of compatible supplies does not void your printer warranty. 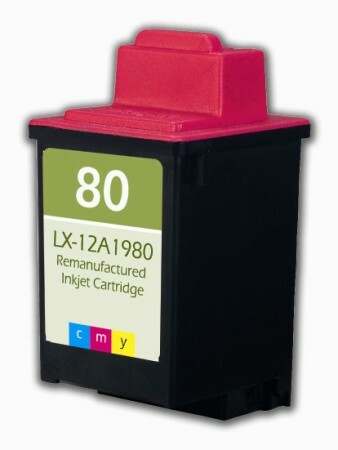 Premium Quality 12A1970S Black Inkjet Cartridge compatible with the Lexmark ColorJet 3200, 5000, 5700, 5770, 7000, 7200, Optra Color 40, 45 and more. The use of compatible supplies does not void your printer warranty. Premium Quality 12A1975 Black Inkjet Cartridge compatible with the Lexmark 3200/ ColorJet 3200/ 5000/ 5700/ 5770/ 7000/ 7200/ Optra Color 40/ 45/ X125/ X63/ X73/ X83 All-In-One/ Xb4/ X85/ Z11/ Z31/ Z42/ Z43/ Z45/ Z45se/ Z51/ Z52/ Z53. The use of compatible supplies does not void your printer warranty.